There never was a truer example of ‘when you’re in a hole, stop digging’. His article in the Observer today is a gift to his opponents, but it does even more damage to himself. He reveals himself as increasingly deserted even his previous closest followers, an utterly broken man watching everything he stood for swept away before his eyes. He has gone from opposition to delusion, from hysteria to denial. But what is perhaps most disturbing of all is that he can’t, as he himself candidly admits, understand why the Corbyn earthquake is happening. 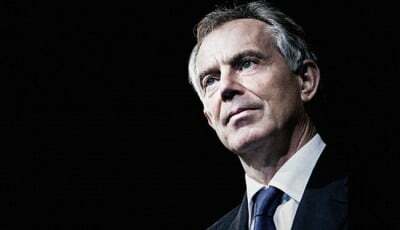 He just blankly refuses to acknowledge the passionate resentment which he and New Labour created by laying the foundations for the financial crash of 2008-9 and making the squeezed middle and brutally punished poor pay for it, by taking Britain without any constitutional approval into an illegal was with Iraq, by introducing into politics the hated regime of spin and manipulation , by indulging now his squalid lust for money-making, and by clearly having no more overriding desire than to strut the world with Bush.